Back in November I wrote a post called '10 Things That Make Me Happy Right Now', and I loved writing it so much that I decided I want to write one of these 'happy posts' every month as a series. Not only do I want to write it to remind me of the things that are or were making me happy at that moment, but to hopefully bring a little happy to you too! It's always a good thing to think about those uplifting moments, things or people that make you smile and my aim is to have something to look back on on a dull day to remind me of those things no matter how big or small the happy things may be! I hope you're going to like this monthly series, because I know I sure am! Being finished with Christmas shopping. This is the earliest ever I have finished Christmas shopping. I can't believe it! Though I have come up with a couple of gift ideas since - I am officially finished... It's just there are a couple more things I want to get as extras and this makes me so happy because it means I can relax on the gift front! I've started reading again. It's been lovely to pick up a book and read again. I was always thinking to myself that I'm too busy to read but I decided to stop making excuses and just pick my books up and read for a little while. Even if it's for 10 minutes before bed - it's better than nothing at all! Christmas Candles. 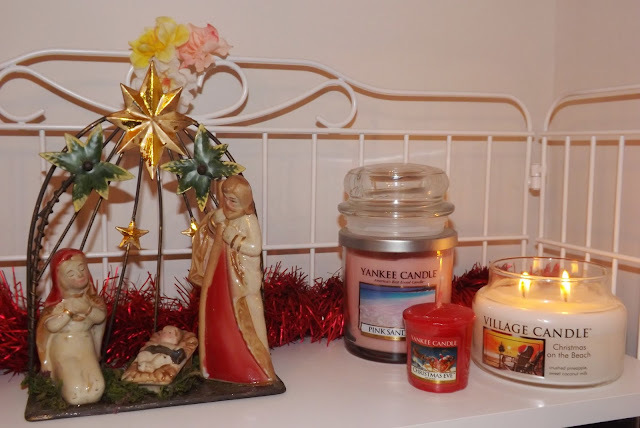 I always get a little candle obsessed around Christmas time and I've just bought myself the loveliest candle called Christmas on the Beach from Village Candle. It smells like a Pina Colada and it's the most amazing smell. I love walking into my room after burning this candle because it lingers for a while. I've also got the loveliest Christmas Eve candle from Yankee Candle. I'm actually waiting for Christmas Eve before I burn it! I re-discovered my magnetic nail polish. This is my revived new favourite polish right now. Remember when it was a big craze a few years back? Well looking for a change in nail polish I rediscovered it in my nail polish collection and pulled it out. I forgot how quick, easy and effortless it was to apply and how cool it looked. You'll probably be seeing this again on my nails for a while now. I'm in a really happy place with life right now. In general everyday life I am a happy bunny and a half! I've got things going my way for once and I feel like being as pro-active as I have been lately has helped me get there. In short right now I'm really enjoying my job, I've also applied for university and I'm waiting on replies; I've just passed my numeracy and literacy skills test for university and everyone around me seems to be in a good place making me equally as happy if not more! I've been really good and doing Yoga on a weekly basis. Thanks to Yoogaia I've been happily taking live yoga classes from my own home! I have a yoga mat and work out gear and it's nice to not have to go into a gym to be able to work out! This is my first proper experience of doing yoga and I'm loving it. I'm so glad I've taken it on and after my trial is over I am definitely getting a subscription to carry on. I have a goal to be bikini ready by April for my holiday! I found a red/copper tone eye-shadow to replace one I ran out of in a palette! This sounds so silly, but I was getting a little upset the other day that my favourite shade of all the palettes I have is about to run out. In my desperation and search to find a replacement, I went into MAC and found the closest thing to it that I've seen since my search started literally months ago! I bought MAC's Eye-shadow in Coppering and because I loved it so much found a lipstick that matched to create an awesome full on coppery make-up look. One could not be happier about a single eye-shadow colour. I get two weeks off for Christmas. The perks of working in a school... I've got my birthday, all of Christmas and all of New Year's off and I don't have to fight anyone for it like you do in retail! I'm so happy about this because I haven't had all this time off in years. I'm really going to appreciate it and make the most of it! I'd love to know what's making you happy right now! Share your 'happy things' in the comments! Woah! No joke, I can relate to your whole list right now! Christmas is the best, I love that decorations are everywhere and music is playing :) I finished my Christmas shopping too! Now I just have to wrap it all and that's probably my favorite part! I was never a reader and in the past 3 months, I've read 3 books. I'm really proud of myself - it feels awesome to get through a great book! I'm SO happy right now too. I won't get into it all on your post, but I'm finally feeling great and feel like the future for me is looking awesome. And at my school they have yoga classes every night and I love going! Sorry for the long comment - as I was reading your post I was relating to everything you said!